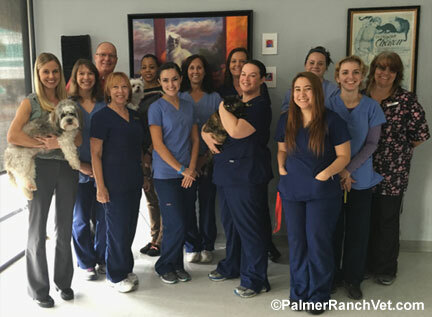 Palmer Ranch Animal Clinic is a well-established, full-service, small animal veterinary clinic serving the Sarasota area since 1991. We strive to serve our clients, their furry loves ones and our community through our commitment to excellence, compassionate care and client education. We provide a broad spectrum of diagnostic procedures through in-house testing and the use of external reference laboratories. We also work closely with local and regional specialty practices when advanced diagnostic procedures are required. Our facility is equipped with a well-stocked pharmacy, in-hospital surgery suite, digital x-ray, and full service grooming and boarding. At Palmer Ranch Animal Clinic we strive to offer excellent veterinary care, allowing you to enjoy your companion for years ahead. Our job is not only to treat your pet when he or she isn't feeling well, but also to show you how to keep your best friend happy and healthy throughout life. We pledge to ensure efficient communication and encourage a healthy relationship between you and your pet in a stress free environment. We not only focus our efforts within the scope of our office; we are also devoted to the animal community. Palmer Ranch Animal Clinic proudly supports many 501(3c) non-profit animal shelters. We partner with these organizations to provide veterinary services to beloved shelter pets, so they can have the best chance of finding a forever, loving home. It is our intention to become partners in the journey to optimal wellness. We look forward to working with you and your furry family member.